A deeply personal journal of life behind the camera written by Kirsty. I can barely believe that the last time I wrote in this diary it was June, the months have passed so quickly I hardly know where or how to start. The truth is nothing I am capable of writing right now will explain the half of what I have been through, or the magnitude of what has happened. I need time to sit down, gather my thoughts and write about this time in my life in a few months once everything has calmed down and I am able to reflect properly. I’m currently sat in bed recovering from my trip to Italy to oversee the start of production for the Wonderland book – something that is a huge jump forward from the last words I wrote in these pages back in June. Exhaustion has hit me badly, but I want to catch up as best I can and explain a little of the unbelievable rollercoaster I have been on since the Wonderland book Kickstarter campaign was launched. But first I am adding this video from our trip to Italy – it is just little scraps of moments and processes as the book was slowly born. It is both extraordinary and utterly surreal that after 6.5 years, my dream has finally become a reality, it has changed my life. I know that many people reading this diary will already be aware of what has happened with the book and many of you will have already ordered you copies (I cannot thank you enough). But for the sake of those who are reading this with fresh eyes I will quickly re-cap. 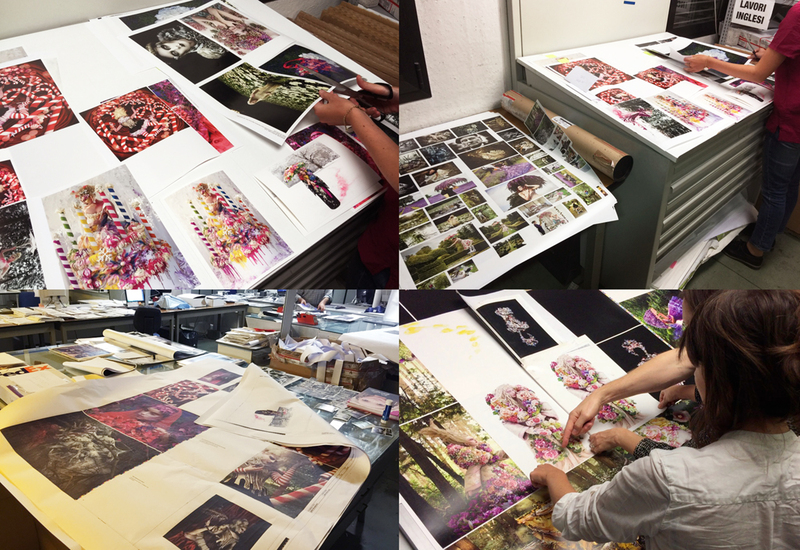 Back in September after months of relentless research, preparatory work, sourcing a designer, and organising years of files and writing, I launched the Wonderland Book Kickstarter campaign. I had made the incredibly hard decision to walk away from the offer of publishers contracts to self publish and keep full control of my images and the quality/design of the book I had dreamt of for so long. It was without doubt one of the scariest decisions of my adult life. Leaving the support and knowledge of a publisher to go into the wilderness on your own is something not to be taken lightly. 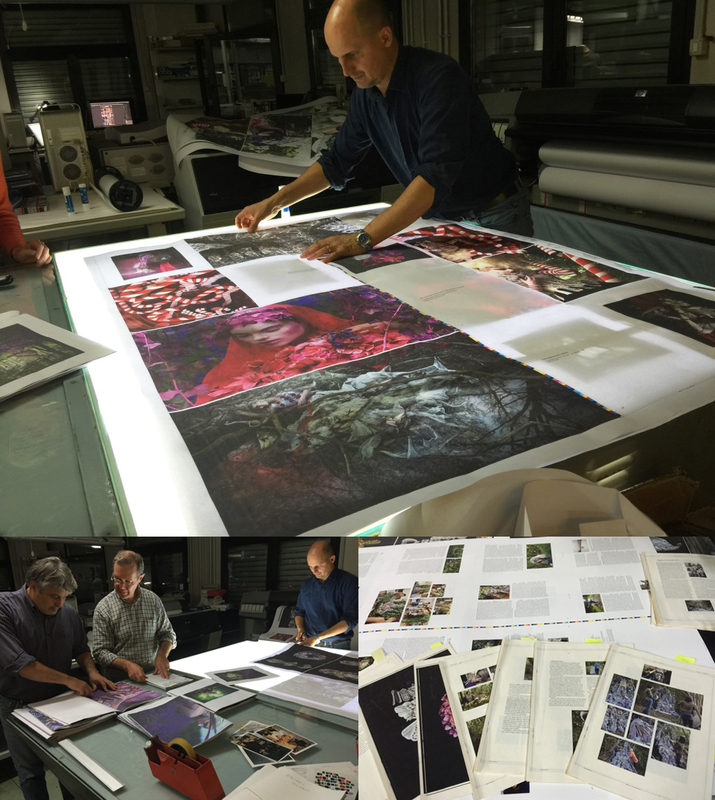 This was not about making a digital book printed in the Far East, this was about the very opposite – going back to the roots of what a beautiful book truly is, being handled by experts and printed on the best quality papers in Italy. I have crafted Wonderland for over half a decade and needed to be in complete control of this deeply personal monologue – something which I soon learned came with an enormous price tag. I will never forget the moment I pressed the ‘launch campaign’ button on the Kickstarter website. I was sat in my living room clutching a faded childhood photograph of my family, digging my nails into the hand of my husband, wearing my mothers old engagement ring. I had surrounded myself with every little talisman I could find, I was terrified, exhausted, nervous and excited all at once and clueless as to what was about to happen. Within 10 hours our target goal of £70k had been smashed, and by 24 hours it had broken the £100k barrier. My phone didn’t stop ringing as hundreds of emails started pouring in from Kickstarter and then the press. The project began racing up the listings on Kickstarter as I sat in complete disbelief watching the total lurch up and up. 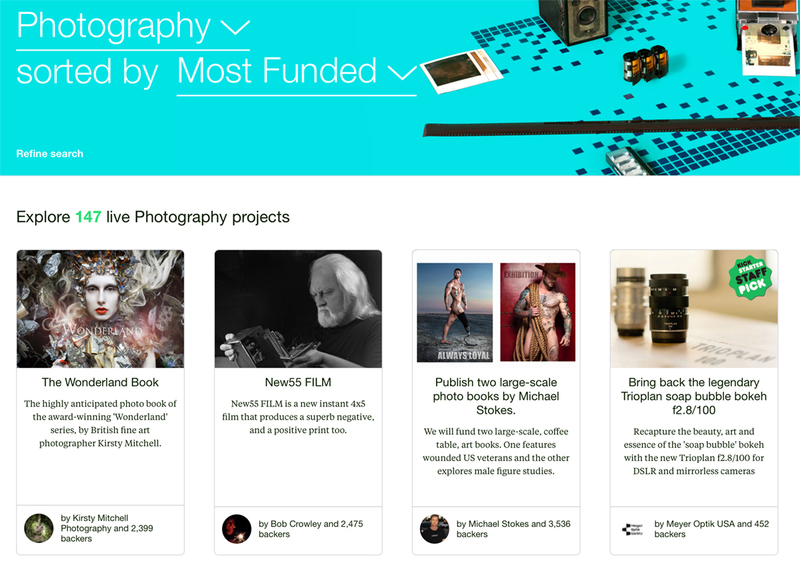 After a week we had reached £200k and were second in line to the most funded photobook on the website. 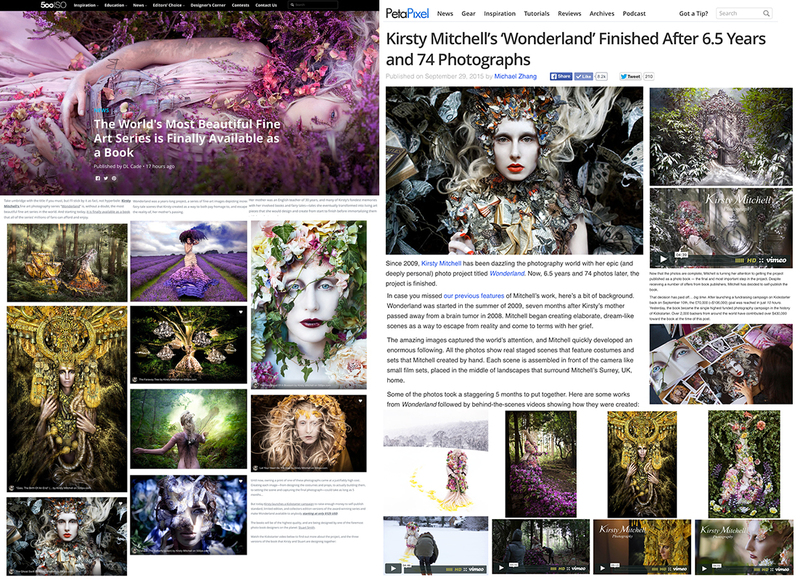 Finally after 28 days of complete madness The Wonderland Book was almost 500% funded and had become the most successful photography campaign in the history of Kickstarter – including all photo books, film, and camera equipment. It had reached a staggering £334k, with over 2500 supporters all over the world. I was in complete shock. I’m aware most of the people reading this will already know about the books success from the updates I have been posting on my Facebook page, so I will save the press coverage for the end of this diary entry and jump straight to the production trip in Italy. There is so much I want to write about how I feel over the reaction to the book and how hugely emotional this entire process has been for me, but I want to save it for a time when I am able to express myself properly as I am genuinely not very well right now. But please know that in the weeks and months before all of this started and the time that has passed since, I have not stopped working, pushing, and trying my absolute hardest to make this book the most beautiful and precious thing I possibly can. That I am completely indebted to you all of your incredible support and belief in this project, and I simply cannot wait to finally send the finished product out into the world and into your hands. I have been so moved by everyones messages, this is so much more than just a photobook, and I promise I will write in more detail as soon as I am able. So here is my week away in pictures. We had to extend our trip and cancel flights twice while we were there as the workload was completely relentless and I would not accept any cause for delay with the delivery for the book. I had promised the book to be delivered in time for Christmas, and if it meant working around the clock from 8am – 3am every day then that was simply what we had to do. 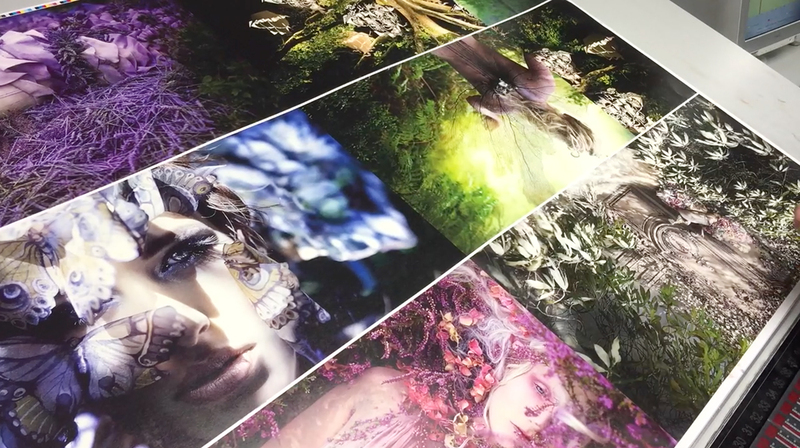 The first and hardest part of working on a book that will be produced with a litho press, is dealing with the implications of your digital images being translated into inks. My work is incredibly colourful, which causes enormous problems when trying to recreate the full colour range / depth of my gallery limited editions for an industrial press. I was warned to constantly to ‘manage my expectations’ but one of the huge advantages of self publishing meant I was able to push everyone to their limits with this matter and didn’t have a publisher telling me to accept a quality I wasn’t happy with. It was slow, hard work. 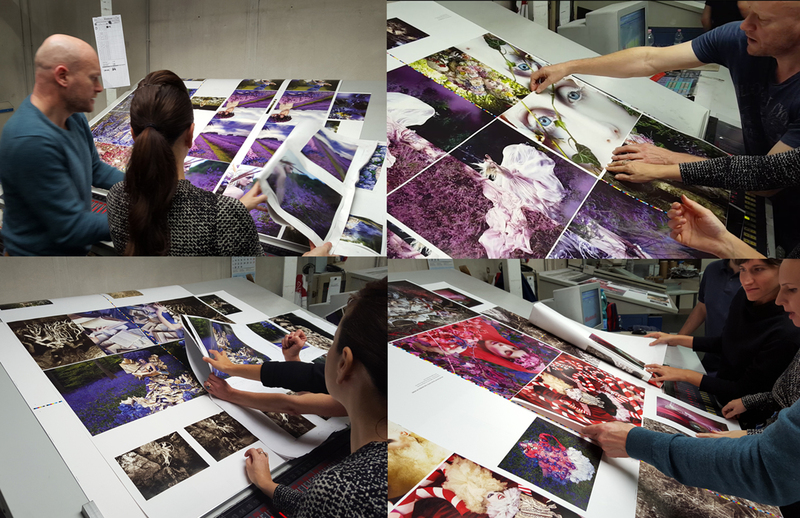 We would test print images using a profile created to replicate the colour / finish of the paper chosen for the book and then check each one under light boxes against the originals I had brought from the UK. There were hundreds of images over 500 – each one looking different to how I knew them. 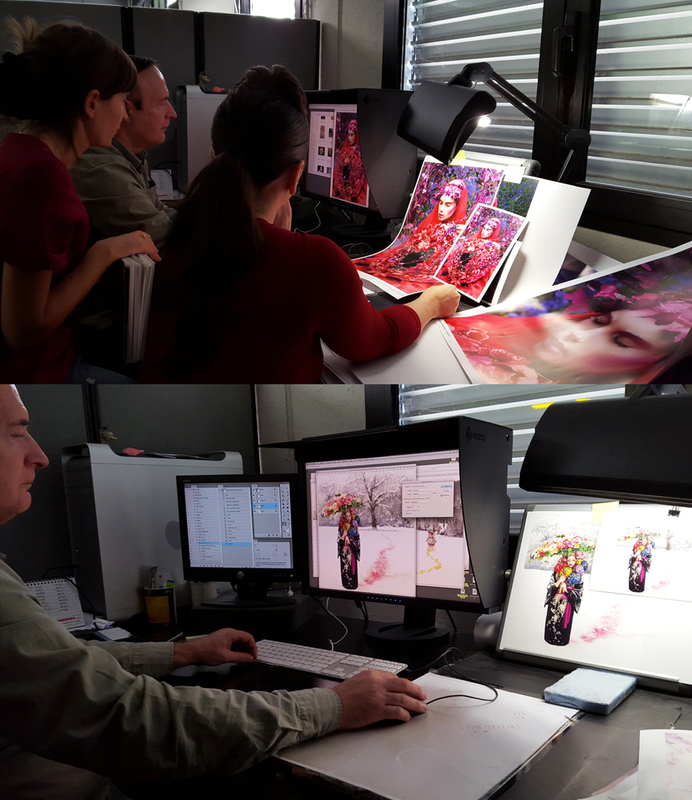 We then had to sit for 2 days making adjustments to each picture until it looked as close as possible. At times I wasn’t convinced, but I was promised the colour and saturation would change once again when the pictures were running on the production line, where I would also be able to make final adjustments. It was quite a leap of faith to say the least but I later found out this was very true once the main press was running. At times the compromise I had to make was the vibrancy of the pictures. 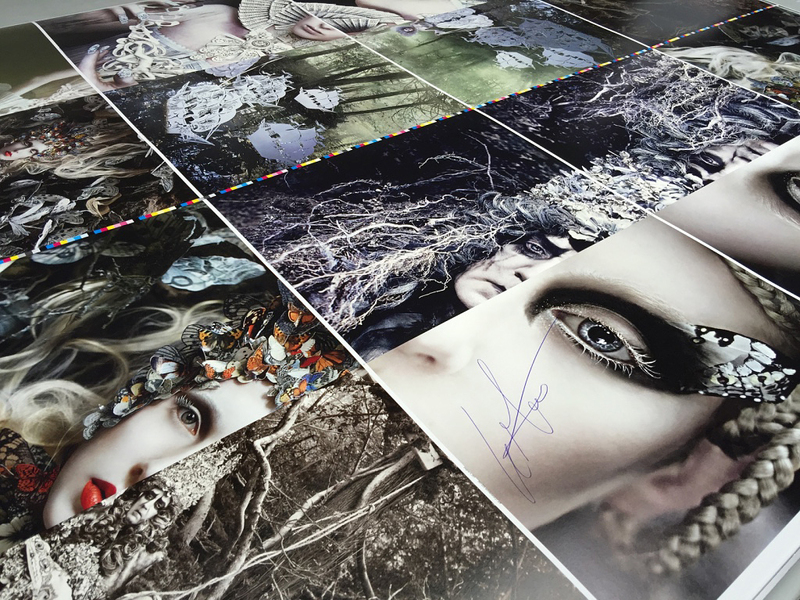 The gallery editions are sometimes startlingly colourful, bordering on neon in places – but this can only be achieved by extremely high end gallery quality printing which is impossible for a litho. I deliberately chose a beautiful almost vintage paper for the book that felt timeless, weighty and like the books my mother read to me as a child. A modern bright gloss finish to the photographs may have looked different but this was absolutely not the esssence of what the series is about, and I felt worked against the design and message I was trying to give. (Above) The first two days of checks and testing around the clock. It was a huge learning curve of me and I’m so grateful for how patient everyone was. 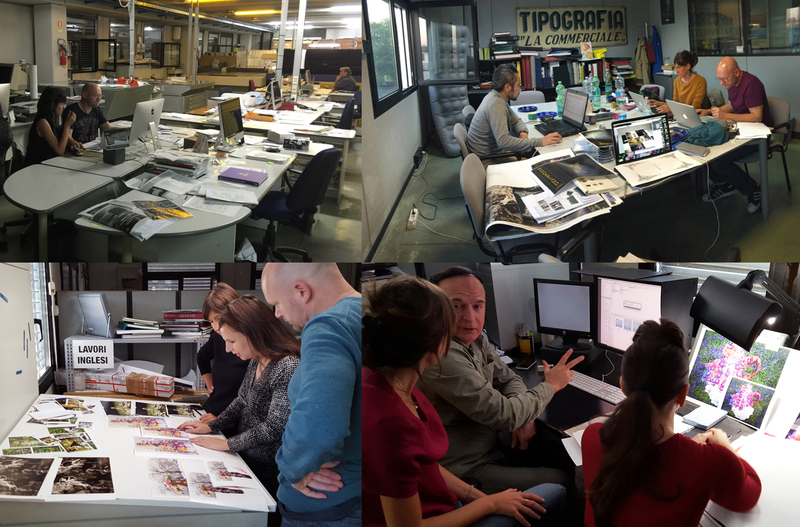 Both my UK design team and the staff of the Italian factory worked so hard to help achieve the very best for each image it was humbling and exhausting, but worth every minute. 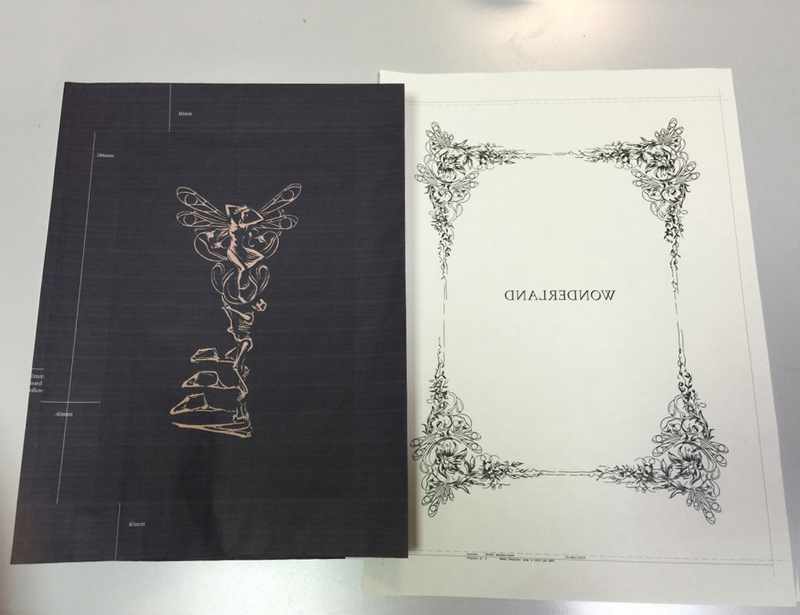 (Above) Once the test printing was approved, the next stage of the book was to create the ozalids. An ozalid is a full paper mock-up of the physical book, correct in every way for scale, layout and design. It is like a dress rehearsal for the final product, produced on low quality paper for myself and the design team to read over and check for any last minute mistakes. This was the first time I really began to have an understanding of the actual book. It was hugely emotional for me, especially seeing the diary pages – suddenly all my years of writing had become a real life book, no longer just words floating around on the internet – their weight felt completely different when printed and suddenly the lives of everyone I loved was there in black and white. Once all the prep work had been approved and signed off, things started getting very real. The photographs were made into their separate colour metal plates and sent down to the main production floor of the factory. I still cannot process how such complex images are created using four colour inks, it is truly quite mind-blowing to witness. (Above) The metal sheets for the cyan ink. 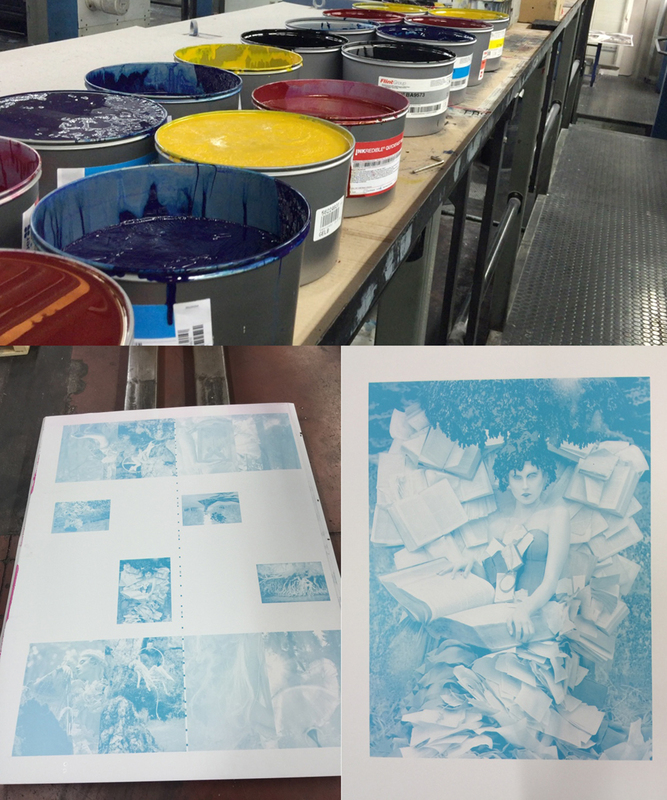 Finally after 3 days of work and hours of delays the plates were ready, loaded into the litho press and production began. 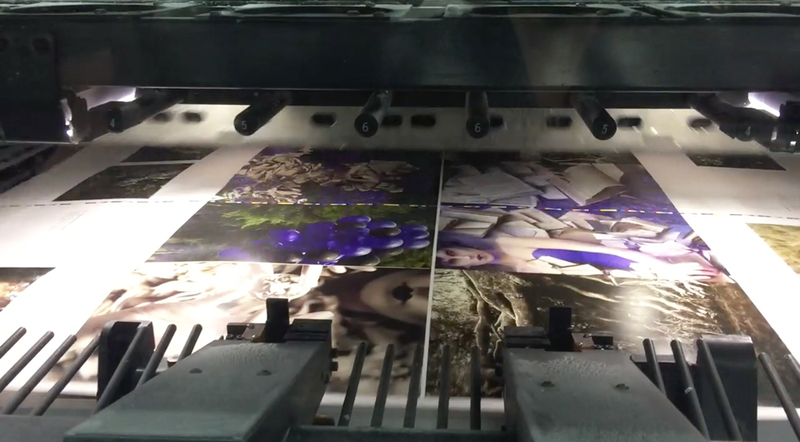 It was heart-stopping to see the enormous machines churning out thousands of sheets of Wonderland images. Every 1.5 hours myself and our design team Stuart and Claudia would have to go down to the factory floor to see the machine operators colour matches to my work for final approval. 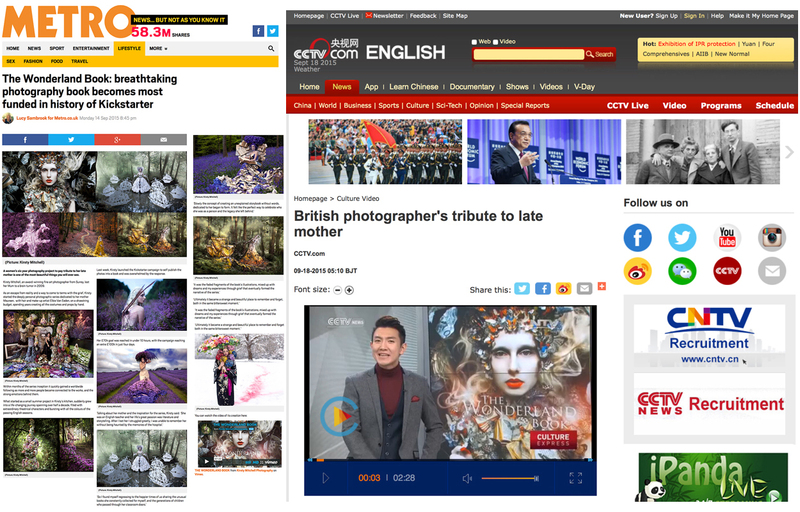 This consisted of another level of checks where we matched the approved images from the past few days, against the colours of the industrial press. Almost everytime there were slight changes to be made, the ink levels would have to be adjusted and further tests made. It was yet another huge learning curve, as for each change we made on a 16 page sheet, it would then affect the other images around it. It was like a a colour puzzle that constantly shifted, sometimes you simply had to accept an image couldn’t be exactly perfect, but almost always I would try to push everyone until it was! It was gruelling work, we started at 8am each day and the print press ran until 3am. So every 1.5 hours I would hold my breath and walk down to the print floor praying for a good match and nothing too challenging ! Despite all the tough checks and long hours, we almost always managed to get beautiful results. Everyone in the factory kept commenting on how wonderful they thought the work was. It was vital I had traveled to Italy for this stage in the book and I was so relieved to be there in person and to be as involved as I was. Colour matching on this scale is incredibly difficult, I know each image like a mother knows her child so at times it was very emotional to have to step away – but I fought, pushed, and made everything the best I possibly could. One of the most thrilling sheet checks we did was for the enormous 3 page fold outs in the book. These sections were the absolute crowning glory of the book, I could hardly contain myself when I saw them in real life! The book was so packed full of zoomed in details and close up double page spreads, that the amount of ink used was slowly becoming a problem. The pages looked amazing but the drying time was far slower than the factory had anticipated, which was the main reason we had to extend our trip. Usually it is a matter of hours before the reverse of the paper can be printed, but the Wonderland sheets were so wet with ink it was taking days. This was a serious issue for the factory but I secretly couldn’t help looking at the finished sheets feeling so proud they looked so glorious, even if it was causing an enormous headache for everyone else! 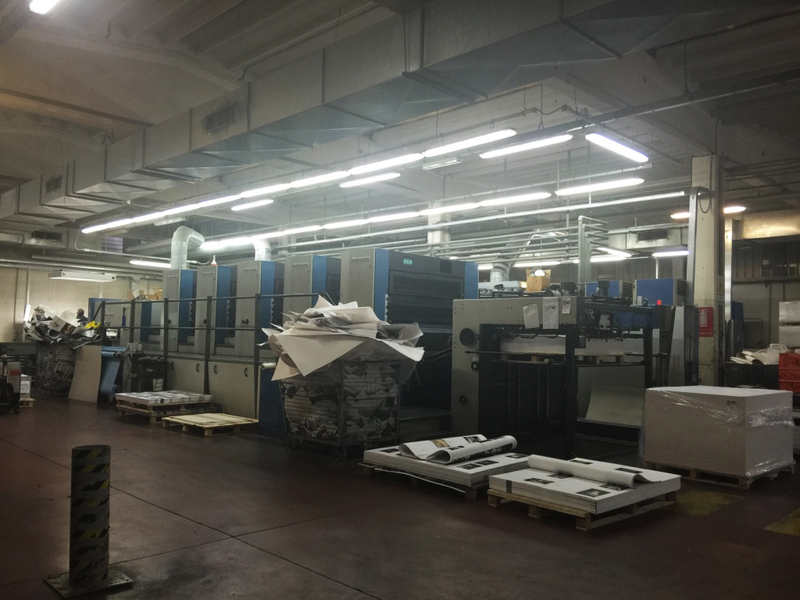 (Below) The factory filling up with 4000 Wonderland books worth of printed paper. It was an indescribable moment to see the reality of everything coming to life. (Above) The reality of our days ! Working endless long hours late into the night called for desperate measures. We had a blow up bed in the office for when any of us crashed and needed a power nap in order to carry on! We ate our breakfast at our desks each morning, and ended up watching movies during the graveyard shift late at night. Thankfully we managed to keep laughing even when we were at our absolute limit. 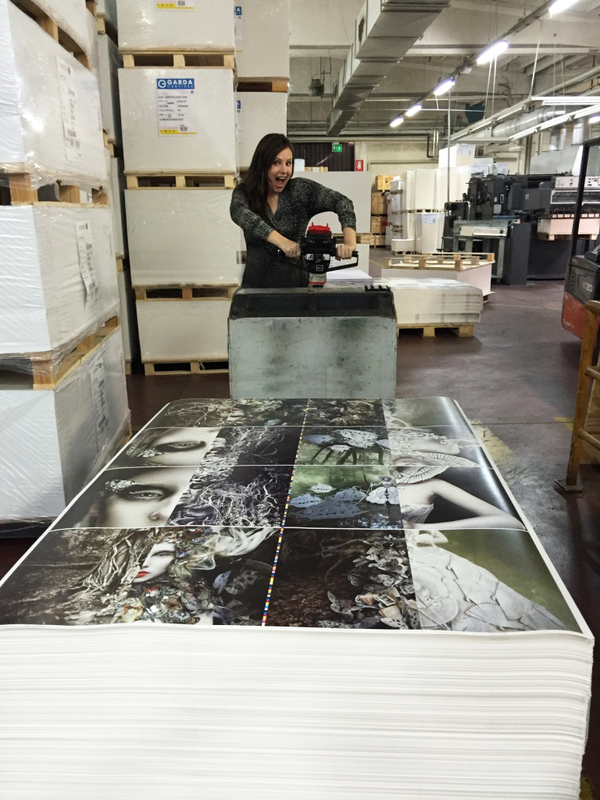 Finally after 8 days in Italy it was time to leave, all 480 pages for 4000 Wonderland books had been printed. It had been an absolute marathon of endurance and a time I will never forget. I learnt so much and now I’m home it is all still sinking in. It reaffirmed every decision I have made up until this point and I know in my heart this was the only way I could have created the book I feel is right for this body of work. My design team Stuart and Claudia were no longer colleagues, they were friends who I came to respect greatly and appreciate every moment of their wisdom and patience with me (we also laughed a hell of a lot). I know full well I was a tricky customer for everyone, I would not compromise on anything unless I had absolutely no choice. All the checks, the tests, the improvements, the delays to make everything as beautiful as I could … people understood when they learned of mums story and saw how emotional this process was for me. The book is everything I have inside of me, every nerve ending, memory, and last drop of adrenaline I could give. I cried when I saw the first page of the book with the little photo of mum as a girl …. and completely fell apart when we managed to rush through the very special last page of the book – something which I will explain very soon in my next diary entry in a week or so. So that is my update for now, more will follow including pictures of the finished book and box sets as they are made. Everybody is working on an impossibly tight deadline and as I write this I am still waiting to see my final cover artwork for the book which will arrive this week. Another wonderful part of collaborating with Stuart for the book meant I was able to design the cover and a very beautiful debossed page for the inside. Above are the designs which I am now eagerly waiting for. The deboss page was an indulgence I wanted to invest funding from the Kickstarter into as I felt it would be such a timeless and precious addition. The next 3 weeks are an uphill struggle until the books are delivered to the UK and we start sending them out to our supporters all over the world in time for Christmas. I can safely say this has been the biggest challenge of my working life, I have never pushed myself so hard and had to dig so deep to keep going, but seeing the book come to life has been worth every moment. All 3 versions of the book are still currently available for sale here, but please note these are now extremely limited and once they are sold no more will be made. The book is huge, 37cm high, 480 pages and weighs almost 5kg. I have no idea what the future holds and whether or not I will produce a more commercial version with a publisher, but for now after all these years I am happy to say that this is everything I hoped to achieve. Today is actually the 7 year anniversary of losing mum, for the first time ever I am not crying and I feel like I am finally taking my last steps away from grief. Over the years I nearly gave up so many times, often talking about a book I never really knew if I would be able to realistically make – so thank you from the bottom of my heart to everyone who has backed the campaign and bought copies. Together we have made a little piece of self publishing history, something I never dreamed possible and still wont believe until I finally, finally hold the book in my hands…..
I’m so looking forward to getting *my* copy of this wonderful book. It’s my christmas present to me so if it’s going to be ready in time for that, so much the better. To be honest (and with past Kickstarter “delivery” dates in mind) I had very limited expectations about when I could expect it. Thank you from me to you and your team for the outstanding work you have put into this project. It’s going to be amazing. So excited to receive my copy! Thank you Kirsty for all your incredible work! Kirsty, Thank you for all of your efforts. I already cherish it. and can not wait to hold it and share it with my family. 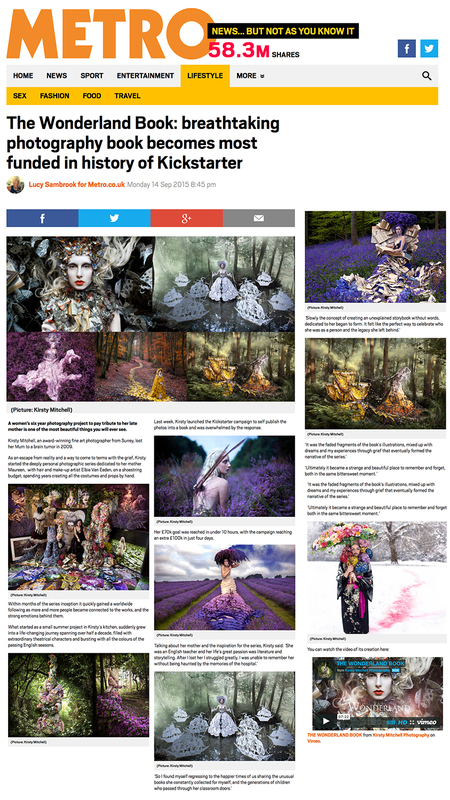 This is pure enchantment in a world of grey Kirsty brings colour and magic. A feast for the eyes. Can’t wait to lose myself in it. i cannot even speak. tears in my eyes. to be a teensy part of something so wonderful, so fantastic, so meaningful, is overwhelming for me. greatest thanks, Kirsty. take care, be well. What a gift, – firstly from you Kirsty and then from me to my Design student Darling Granddaughter., who’s name will be printed in her copy ! Thankyou dearly, I am beyond words for your dedication, creativity and sentiment. There is hope for the world. Thank you so much for the passion, love and work you have put into this. I am so excited to receive your artwork I can hardly stand it. I have been sharing all of your updates to all of my High School art classes, you are a wonderful example of what putting your complete all into something looks like. My students are eagerly following you on your journey as well, you are inspiring a new generation of artist! Thank you for all that you are doing and congratulations! I got goose pumps all over when reading your diary, and that means there are angels in your project!! I am SO very proud of your work, and I have no doubt that your mother must be watching down to her girl with a big grin on her face!! Your book is beyond awesome, and I can hardly wait to hold it in my hands!!! I know what you felt when seeing your precious work come into life – your “baby”! The rush it gives seeing it take life of its own before your very eyes, well, nothing compares to that! (I’ve been experiencing something similar, but with a musical). What a magnificent talent you possess, woman! All my best wishes to you, Kirsty, and once again – CONGRATULATIONS!!! 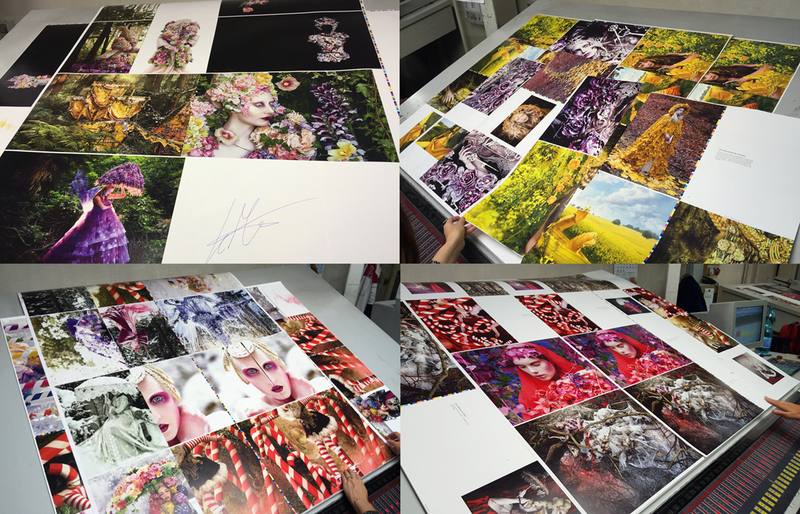 I literally can not wait to receive my copy, looking at these photos has made me as giddy as my children on Christmas Eve! You are such an inspiration to us all Kirsty! Dear Kristy, Wonderful to hear this update and deeply excited to receive this exquisite transmission and embodiment of Love, Beauty, Lucid Magic and Artistry. . I know it will be a treasure shared with many and cherished through time. Love, Sarah .:. Your art has truly inspired me, and leaves me breathless. I am an artist myself, and I am still learning. From the moment I seen the first image, I was captured. From the moment I heard the why, I was beyond captivated. Thank you so much for sharing the love you had for your mother with us. I can see it in your art, and feel it to the depths of my soul.